1 photograph : b&w ; 3 x 5 in. 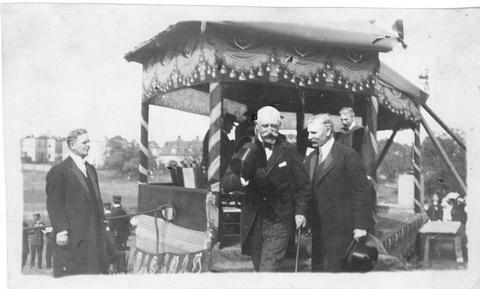 Item is a photograph of Arthur Stanley MacKenzie, the Duke of Connaught, and Mr. Campbell by a gazebo at the cornerstone laying ceremony for the Science Building (now the Chemistry Building) at Dalhousie University. Photograph previously located in PC2, Box 5, Folder 7.